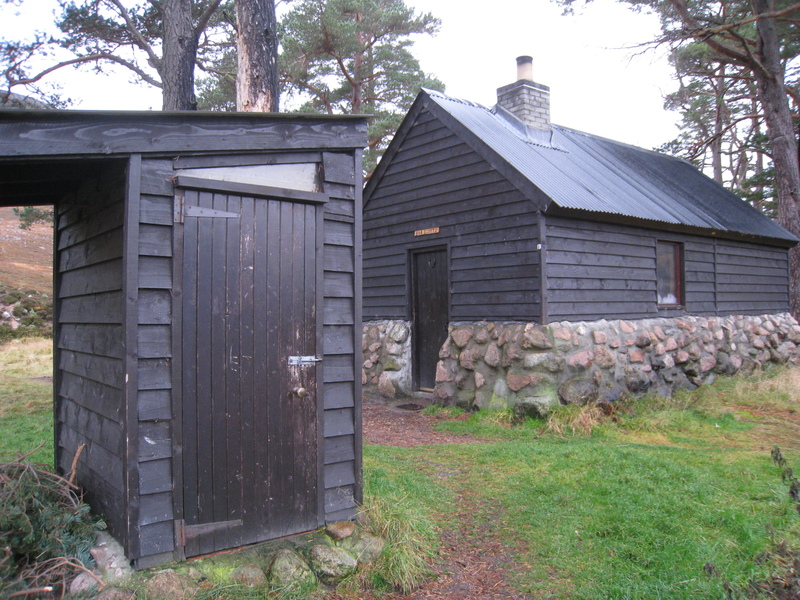 The Cairngorm range boasts a number of bothies, some of which have been substantially renovated in recent years and which rank as among the best in Scotland. Most regular hill-goers know the score with bothies, but for the benefit of those less familiar, a word or two is perhaps in order. A ‘bothy’ traditionally was a building constructed for the accommodation of farm or estate workers at or near their place of work. However in modern use of the word it is a building used as shelter for walkers and climbers in (mostly) remote areas. In the Cairngorms, as across Scotland, these buildings have various origins, from former farmhouses to shooting lodges to traditional bothies, as well as some which were custom made. 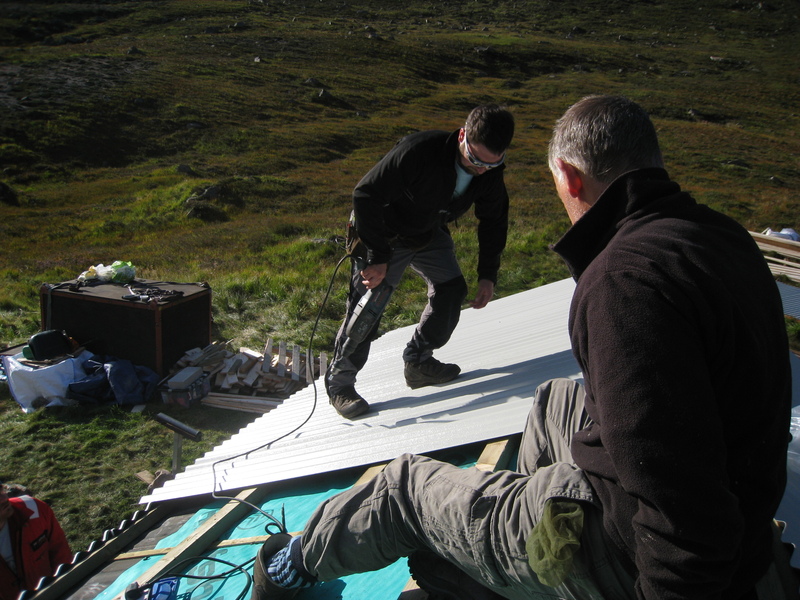 The rebuilt Garbh Coire Refuge is now weathertight but still offers only basic accommodation. There is also a distinction sometimes made between bothies and ‘refuges’. A refuge will probably be smaller and more primitive accommodation. The Garbh Choire and Fords of Avon refuges are obviously in this category: offering no more than shelter from the weather and, as the name suggests, a place of refuge rather than one of resort. However the Hutchison Hut was built as a refuge and, though it certainly once fitted the bill, is now accepted as a bothy. Despite that, in deference to the preferences of estates, I have listed refuges and howffs in a separate section of this site. Anyone can make use of a bothy, either for an overnight stay or as a base for a day or two (longer stays are discouraged), or even just a lunch stop. Accommodation even in the best of bothies is basic: you will be out of the weather, but not all bothies have a fire or stove and none of the Cairngorm bothies have electricity. You must have all your own bedding and cooking equipment and be prepared for sleeping on at best a wooden platform, at worst a stone floor. For facilities at an individual bothy check the relevant page in the drop-down menu. You should also have alternative accommodation in mind if you turn up and find the bothy is full, especially if you’re travelling as part of a group. (The Mountain Bothy Association code asks that people not turn up in groups of more than six, though even that will put a strain on some of the smaller refuges.) In an emergency situation I have never heard of anyone being turned away from a bothy, and the tradition of communal help is such that most people will try and squeeze you in, but some bothies can be very busy and carrying a tent can make all the difference between a good night’s sleep and none at all. Having given that warning, in some bothies you are likely to be the only resident and even in the more popular bothies you can find yourself rattling about on your own. But the best bothy nights can see you sharing your accommodation with a mind-opening variety of people. I’ve shared a bothy – and some great conversations – with people from many countries and all walks of life. I’ve talked with a (hopefully) reformed armed robber and with a retired police inspector, with a Swiss solar physicist and her companion an ‘ordinary’ nuclear physicist, I’ve witnessed an English geologist arguing for the UK and capitalism, bravely holding his ground against a bothy full of socialists scheming for independence… I’ve even met a guy from Luxemburg! 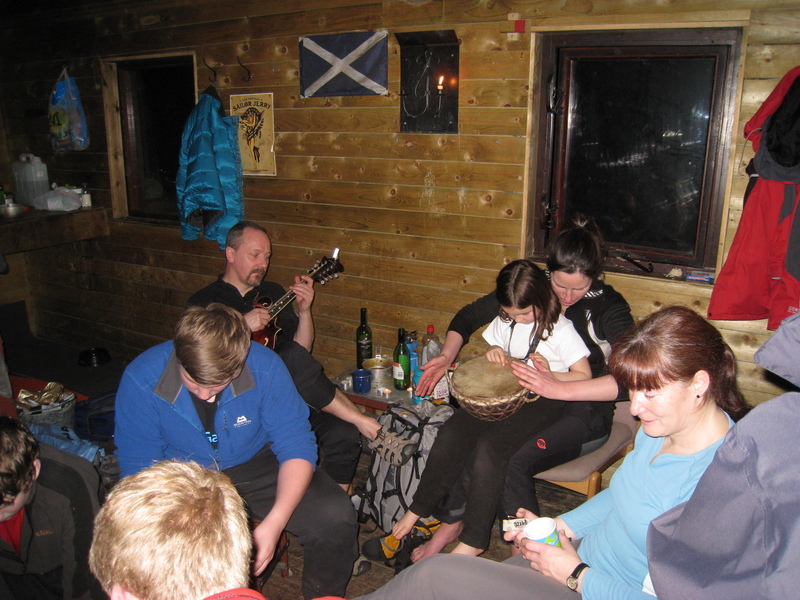 And I wouldn’t want to build expectations, but with guitars, whistles, mouthies, mandolins and bagpipes all making occasional appearances in bothies, I’ve enjoyed some great impromptu ceilidhs too. A musical soiree at Bob Scott’s – with all ages taking part. Of course not everyone is going to be your new best pal, and there are people who simply prefer to keep their own company, but the one thing you should be able to rely on from a bothy companion is trustworthiness and mutual assistance. I’ve both given and received advice in bothies, shared someone’s last teabag and seen a drookit traveller clad for the night in bits and pieces of several others’ dry clothes while his own hung in front of the fire. In a bothy you really are all in it together. The bothies covered in this site are all free for anyone to use, but it should be remembered that they still remain the property of the owners – usually the estate which owns the ground – and their continued use is not necessarily guaranteed. That being said, the Cairngorm bothies have all been in use for many generations now and should continue to be available for many more generations if we treat them as the valuable resource they are. Hi Ian, I don’t know of any central reservoir of bothy pictures, although Aberdeen City Libraries might be interested. If you want to email them to me (I’ll email you my address) I can perhaps use them on the blog here, though it would be good if you could add a few words about your experiences back in the ’50s to add context to the pictures. I have stayed in Corrour and Etchachan Bothies on numourous occasions In the seventies and had some good nights. Had some good nights myself back then, but I have to say I prefer them as they are now. Maybe just getting soft in my old age! @ cairngormwanderer: So glad I stumbled upon this! Question: do you have a favorite or highly recommended hike in Cairngorms? Looking for an overnight, maybe 10 miles total, however flexible on distance…looking for some epic scenery! Thoughts? Hi David, hard to pick a favourite – many of my best walks are more or less aimless wanders. Cicerone do a good guide to walks and scrambles in the Cairngorms, by Ronald Turnbull, but Cairngorm walks do tend to be longer, and an overnighter is likely to be more than just 10 miles. Head in to Corrour and climb Devil’s Point and Cairn Toul, or walk the rim of the Garbh Choire from Braeriach to Cairn Toul (or head into the centre of the plateau for a taste of remoteness). Loch Avon is a good spot to visit too, and maybe better meets your distance criteria: head over from the Cairngorm side, drop down Coire Raebert or Domhain and camp or stay under the Shelter Stone. Next day you can go up Beinn Mheadhoin or up onto the McDui plateau and back over Cairngorm. The thing to remember about the Cairngorms is that it’s very often as much about the glens and choires as it is about the summits. Hi. Don’t neglect Glen Feshie. My favourite, having frequently stayed at Kincraig, was to climb Carn Ban Mor from Achlean, then head south to Mullach Clach a Bhlair. Apart from the high plateau, this gives fantastic views in all directions, but particularly the amazing layout of the River Feshie itself, not to mention its ‘little’ tributary the Eidart. There’s a good camp site at their junction. Enjoy. Thanks for the interesting article, very helpful.